Government debt under Labour was a major factor in the elections of 2010 and 2015. 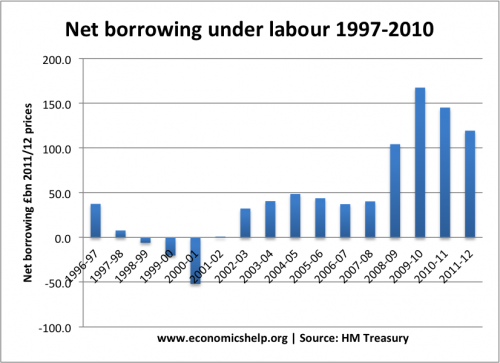 But to what extent did the Labour government really plunge the economy into debt during 1997-2007? Usually, when people say ‘it’s debt that got us into this mess’. They tend to view all types of debt as the same – equating government debt to financial debt incurred from selling sub-prime mortgages in the US. However, this is deeply misleading. The consequence of bad debt defaults in the financial system is very different to government debt financed through selling bonds. 2010/11 – 60.0% of GDP. At the start of the great recession in 2007, public sector debt had fallen from 40.4% of GDP to 36.4% of GDP. This was despite increased real government spending. After the start of the crisis, public sector debt almost doubled in the space of three years. If we look at just actual government debt, there is a significant increase. Debt to GDP statistics were helped by the period of strong economic growth – a reminder that economic growth is as important at debt levels. 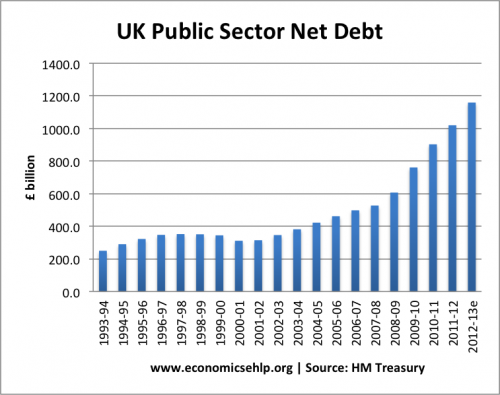 It is also worth bearing in mind UK public sector debt in comparison to the post war period. 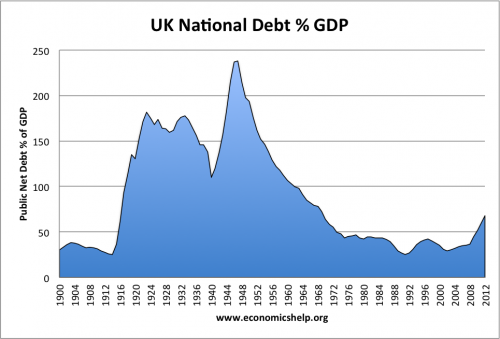 Even public sector debt of 60% of GDP is quite low compared to the historical average of public sector debt in the UK during the twentieth century. The very high period of debt in the 1950s was not a barrier to economic expansion. Government borrowing as a % of GDP. At the start of 2007, there were few economists expressing concern at government borrowing running at 36% of GDP. By post-war standards, UK government debt was low and the government appeared to be meeting its own reasonable fiscal targets. Given the period of strong economic growth, it is unsurprising that Labour wished to increase spending on health care and education. If the financial crisis hadn’t materialised, we may have looked back on the great moderation with kinder eyes. However, a critic would point out that we did have a financial crisis and running a budget deficit during an unsustainable economic boom was irresponsible. 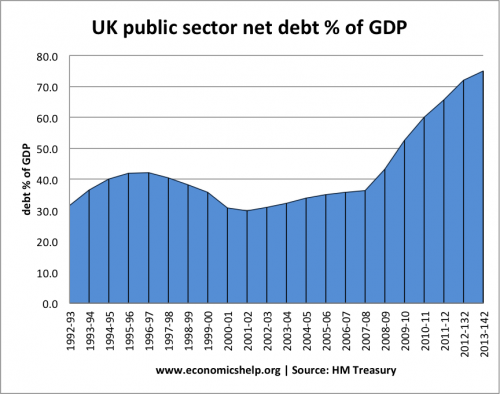 In retrospect, Labour would have been better reducing the public sector debt further. This would have given the government even more room for manoeuvre during the crisis of 2008-12. Also, with growth strong, this was the best time to reduce the budget deficit. The mantra of Keynesians during the crisis has been – a recession is the wrong time to reduce a budget deficit. Given high growth in the 2000s, it would have been better to be stricter with public spending. Even counter cyclical fiscal policy measures such as higher income tax, higher stamp duty may have reduced the housing and financial bubble and made the subsequent crash less dramatic. Of course, it is easier to be wise after the event. If we were more aware of the dangers inherent in the financial system, we should have exercised much more caution. But, when looking at the causes of the great recession – government spending levels and budget deficits of the preceding years bear little if any cause. It is also worth noting that when the recession hit, the government did initially pursue expansionary fiscal policy – there was no panic in the bond market. Bond yields have fallen throughout the crisis. Although debt increased rapidly, there was no danger of a fiscal cliff, like say Greece. The switch towards austerity post-2010 was largely a self-created panic. Part of the motive for austerity was the desire to paint a grim picture of public finances. The problem is that economic pessimism can become self-fulfilling. A more balanced view of the overall state of public finances in 2010 would have led to less rash policy. This entry was posted in debt and tagged debt, uk debt. Bookmark the permalink. Rubbish. Labour halved our manufacture and invested in bankers. These were lean years for many a small business and Brown ran a deficit from the second election on. This meant pro-cyclical rather than counter cyclical budget deficits. Inflation was hidden by a move to CPI rather than RPI, and a yawning trade gap with cheap foreign imports. There was no real net growth after 2005 because it was all built on increased public and private borrowing. Brown borrowed into the future too, expecting receipts to continue rising. This is partly why public spending has increased so much since – we still have an overbloated public sector with record pay levels, growing debt and deficit, and NO economic growth. Brown created the illusion of prosperity but by ditching manufacture, he ensured we will not recover for a long long time. Had we gone the Balls route, our debts and deficits would be even greater. You just cannot accept labour are better managing the economy than tories , history prove it the tories always run higher debt ! Levels of debt, on their own, are not a very good way to evaluate economic performance. Public sector debt (including debt to GDP) under the Conservatives government 2010-16 is significantly higher than the previous Labour government, but on its own this means very little. Well said, the Tory PR machine did a really good job in persuading the public that Labour were bad at economics. The evidence shows otherwise. How on earth is having the biggest ever national borrowing debt better at running the economy? Are you just blind to the figures? Because that borrowing is the result of what has gone before you. The only thing you have control over as a government is the direction of the deficit. The Tories have always managed the deficit more sensibly than Labour. There is nothing wrong with a deficit, nor its size – what matters are these points in the context of the economic cycle. The Tories are always fixing a problem, whereas Labour are always creating it by overspending during expansions as well as recessions. We are discussing debt not deficit. Cameron was ticked off for this deliberate obfuscation by the UK Statistics Authority. The conservatives closed more collieries than labour. 585 + to 370 +. McMillan closed more collieries than any other prime minister in one term. 41 PSNB budget deficits. creating £1.1 trillion debt. gigantic debts in the NHS , amounting to hundreds of Billions of pounds of outstanding PFI debts ,as well as the debts inside HM Treasury. Labour did not halve manufacture. More manufacturing jobs were lost under the last Labour government than the Tory one which preceded it. Its seems given everything I’ve read here from both ‘Google Economics’ and every one else who has their own opinion ….I’m still really none the wiser. Its seems that depending on ‘who you vote for’…..Idea’s and facts change considerable…..But then that’s politics for you….’its not the truth that’s important, it’s who and what you believe!…sadly! Were you not around in the eighties? The Thatcher policy was to break the unions by reducing the industries where they were prevalent and move us to a non manufacturing, financial services economy. As an engineer I saw big reductions in manufacturing. Major’s term continued this. Skilled apprenticeships became consigned to the swarfe bin. Stock and commodity traders were in the ascendancy, which was good news for builders (remember “Loads o Money”). Labours first term from 1997 started to redress things but was too slow. I find it funny that the Tories have been claiming apprenticeships as an innovation. The eighties legacy was found out in the crash. No plan B or underlying manufacturing. Small start ups are not the same as British Steel, BMC, ship building, aircraft manufacturing, train & locomotive. I’m stopping now, it depresses me. Basically you’re so wrong. Jack Dash – took the dockers on strike, replaced by containers. British car industry, destroyed by the likes of Red Robbo, Longbridge, Hailwood , Dagenham , Vauxhall, all gone as we know it, and replaced by overseas manufacturers. Steel industry overpriced and lost out to cheaper suppliers. Most of this was even before Thatcher came to power. In 13 years from 1997/8 to 2009/10, the Labour Government increased debt by about £420 billion. In the 5 years from 2010/11 to 2014/2015, the Coalition Government will increase debt by about £600 billion. These are the facts. Yes, though I’m always nervous about extracting facts like this. Remember for the first 4-5 years of new government you are committed to previous government spending, the first 4 years of labours government benefitted from Tory plans, similarly Labours spending commitments don’t stop as soon as they left government in 2010. What about after 6-10 years then? Hammond has said we will be 1950 billion in debt in 2 years time = 90% of GDP. So Labour were crucified for debt rising from 352billion to 902 billion, under this lot it will rise by more than a trillion. Tories have bullshitted all of us into believing they know best. But Labour had a Global Credit Crash which Tories did not have. Tories created the biggest list of millionaires and billionaires in the world while they introduced austerity bringing people to starvation and suicide. Now they are determined to break the NHS to introduce private insurance like USA. No concern to them because they have it already and write it off on expenses which we pay. The Obesity Time Bomb will break the NHS. There is nothing wrong with an Insurance based Health Service, most developed countries operate this way. Canada, Australia, France, Germany, Ireland we should do the same. Our system is used and abused by too many. Are you joking. The NHS is one of the greatest institutions ever created in the whole world, it is the very corner stone of this country. No matter what you will, or should, be looked after if you are unfortunate enough to fall ill. Are you honestly in favour of an insurance based health system. The poor and lower social classes in America die. There children die because their parents can’t afford medicine. Why do you think Trump is repealing Obama care. Let me enlighten you. Free health care costs money, money that would no longer go to insurance company’s. The health and welfare of the American people comes second to money. This shower of cruel elitist bastards that we have governing us would happily privatise our health system. The poor would suffer. The rich keep getting richer and the poor suffer. governments number 1 job should be making the lives of people better. As for business and economics they should be the means to an end sadly people have not been the priority for this government just a number a human resource nothing more. has made financiers enormous fortunes . The bank bailouts weren’t on the government books. Dolt. Debt can’t come down until the deficit is brought under control. Labour massively increased the deficit and thus debt for years to come. The trouble is many of the blinkered Labour supporters don’t understand that if you are commited to spending more than you earn, you build up the debt. Under Labour we were spending £152 billion more than we were bringing in. Because the coilition and later the Conservatives had these huge commitments of spending, they had to get them under control. They had to reduce public spending, unpopular though it has been the austerity programmes have reduced the difference to £53 billion, even allowing for the interest paid on increased borrowing, a reduction of nearly £100 billion. Even so we are still spending £53 billion more than we earn. At the same time unemployment has fallen drastically, and there is record employment even with the huge imigration that we have endured. The tories have 1.7 trillons pounds in debt can some explain how that is possible plus dont forget all the cuts cuts !!!!!. Yes, £1 trillion of that debt was left to us by Labour in 2010. 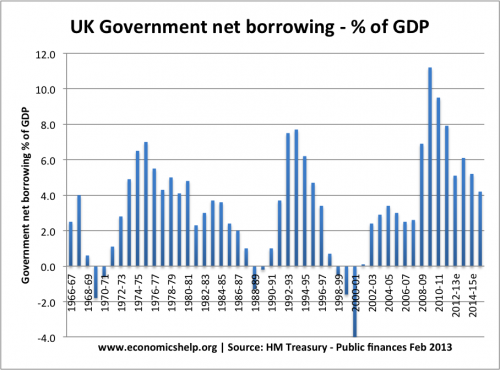 Net borrowing has decreased year on year since, mainly due to careful housekeeping and as you say “the cuts cuts”. Labour left a national debt of £811 billion after 13 years and bailing out the banks. In 7 years although greatly benefiting from the repayments for that bank bailout, a strategy swiftly followed by the rest of the world the Tories have added well over £900 billion to the national debt. Labour’s debt included what was inherited in 97. Debt accumulates exponentially and you only start to pay off debt when you stop running at a deficit and start running at a surplus, labour invested heavily and increased the deficit when we went into a recession (ridiculous thing to do) and left a huge amount of debt which has been accumulating, tories have reduced the deficit massively (hence the public spending cuts) and are close to running at a surplus, at which point they can start to reduce the national debt. Labour policies only look short term and want to turn increase it again and throw our country further into debt, screwing us over for the future. Is spending more in a recession a stupid thing to do? You could argue that cutting public spending in a recession is more irresponsible. A declining economy is what drives up the deficit and national debt, cutting public spending during a recession only exacerbates the decline. True but look at the NHS. New Labour overspent on this, increasing staffing levels, awful PFI deals, wasted billions on NHS IT system, but despite the amount they put into the NHS & input increasing dramatically in terms of staffing, output in terms of productivity did not increase in terms of – reducing medication errors, reducing LoS, fewer pressure sores, reducing mortality & morbidity rates etc. Public services has to be efficient otherwise it is like a sponge absorbing more & more money but no change in efficiency. That is what the Tories inherited, so until it really transforms itself in terms of safe, high quality of patient care then it will remain a sponge. You simply just cannot throw money at public services without a radical transformation plan. Public services that are inefficient as will continue to increase the deficit & in turn the national debt, because until you get a surplus in the deficit you cannot possibly begin to pay off the national debt. So yes the debt has increased under Tories, but the legacy debt inherited, & a huge deficit has to be reined in somehow. Reducing deficit has to be tackled first surely to have any hope of paying off Debt! Who is this Jamie Dow trying to con . The lower social classes in America are not left to die as hospitals are mandated by law to treat everyone . They then attempt , not always successfully , to get paid . Those with insurance are paid for by their policy . The others either don’t pay anything , or the Government covers it . I know because I just spent five years there and saw the system in operation first hand , not through the prism of the BBC or the ” enlightening” Mr. or Mrs. Dow . Obama called people with no policy ” freeloaders ” and it was his major reason for making the ownership of a policy mandatory , penalized by a tax as a percentage of income if no policy was in operation . The only people who are now freeloading are illegal immigrants who tend to work for cash in the black economy . Finally , I found U S health care superb in comparison to the NHS but I did have to pay the Obamafine until I got a policy in my final year there . David Cameron when he became PM was advised nicely by the Japanese government,NOT to use austerity they did 11 years before this government and they said they are still paying the price for that mistake. Compare how John Major brought down the Deficit with Cameron/ May. He did better WITHOUT Austerity and without massively increasing the National Debt.